The IDC’s Tertiary Institutions Business Plan Competition creates a platform for engagement with colleges and universities, aimed at identifying, nurturing and enabling the next generation of entrepreneurs in the country. Simpler, lower cost AGVs (automated guide vehicles) that will cater to the needs of both larger and smaller South African firms. This is the product of the business plan that won a group of MBA students from Nelson Mandela Metropolitan University (NMMU) first place in the Industrial Development Corporation’s (IDC’s) third annual Tertiary Institutions Business Plan Competition. “Localised manufacturing is always an important objective for the IDC, especially when the manufacturing plant is established in a province where unemployment is very high,” IDC Chief Executive Officer Geoffrey Qhena said at the awards ceremony in Johannesburg on Wednesday, 29 April. 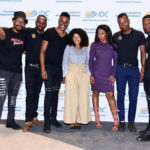 The competition seeks to create a collaborative platform for the IDC and its subsidiaries to partner with tertiary institutions around the country in helping aspiring student entrepreneurs to develop solid, quality business plans. And it’s not merely an academic exercise: the first, second and third place awards give the winners capital to help them start their businesses. “We want these ideas to be realised so that these potential business can be funded so that our economy does indeed benefit,” said Qhena. Along with the R100 000 first prize, the AGV business plan won the R10 000 special category award for most comprehensive and best written plan. 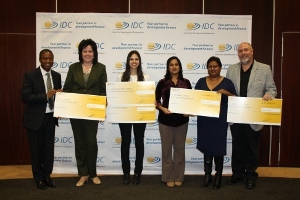 The three special category prizes reward business concepts that address the IDC’s specific mandate areas. 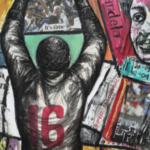 “We are very excited at the prospect of getting this project on the go,” said recent NMMU graduate Mieshkah Dolley-Ryneveld, who conceptualised the winning plan along with fellow graduate Harold Meyer. The R75 000 second place award – as well as the R10 000 special category award for most innovative plan – went to a group of MBA students from Milpark Business School in Johannesburg for their “Alter Chicken Feed” business plan. This plan focuses on farming maggots as an alternative protein chicken feed, to replace the soya and maize-based feeds which account for 60-70% of costs in the chicken industry. And the R50 000 third place award, along with the R10 000 special award for most socio-economically impactful plan, went to another NMMU team for their “Sun Wheel Seeder” plan, which looks to manufacture a low-cost seed planter that is suitable for small-scale farmers. The third special category award recognises potential entrepreneurs for their ability to spot an opportunity in the market. The Spirit of Entrepreneurship award went to another group of Milpark Business School students for their EcoEnergy plan, which seeks to harness anaerobic digestion to enable poultry farmers to convert chicken manure into cost-effective electricity.